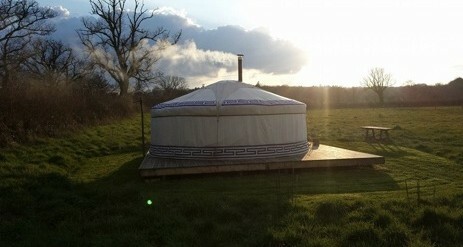 Tracy, Jason and Ozzie welcome you to Glamping at Holly Farm in glorious South Somerset. Just minutes away from the Beautiful Blackdown Hills in a quiet country location close to the Devon and Dorset borders. The Jurassic Coast is just 30 minutes away with lovely Fishing Villages like the famous Lyme Regis. Holly Farm is an ex-dairy farm set in a peaceful rural location now run as a smallholding with a range of chickens, ducks, pigs and an occasional turkey or 3! We also produce our own organic vegetables in a garden plot and Polytunnel. You’re welcome to tour the farm, feed the chickens, ducks and pigs. Of course we always have a supply of Free Range Eggs for a nice breakfast or omelette. There is almost no light pollution so its also a great place for Star Gazing. The site is a lovely open field with views out to the sunset over Chillworthy and the local woods, you’re welcome to use as much of the site as you like! All our accommodation is equipped with a comfortable beds with lovely duvets and pillows, table and chairs, close by wash room, shower and toilet. Also a well equipped kitchen cooking area close by. Everything you need for a comfortable relaxing stay! 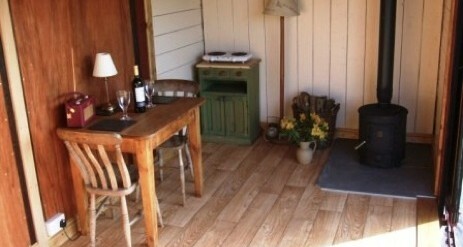 Doors can be opened wide to fully enjoy the views, atmosphere and country air! 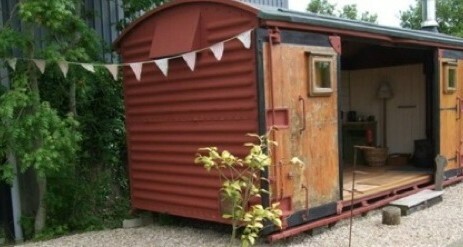 We use an environmentally friendly composting toilet, housed inside a lovely wooden “outhouse”. 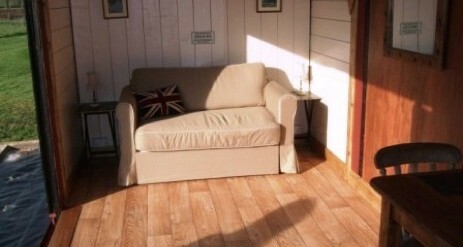 All accommodation has outside seating with views across the countryside. If you want to light a fire and stare into the flames – carry on, there is a fire pit just for you! Based in a quiet rural location but just minutes from the Historic Market Town of Ilminster with its range of local shops and weekly market. The Blackdown hills are just on your doorstep and its only a 30 minute drive to the Jurrasic Coast and the historic fishing village of Lyme Regis. Close to both the Devon and Dorset borders so its easy to discover 3 counties! There are a number of walks around Ilminster and in the local area are The Liberty trail, The Parratt trail and Leyland trail, Neroche Forest, Otterford Lakes, Blackdown Hills, Ham Hill plus many others and for the more active the South West Cycle Path passes by just 200 yards away. 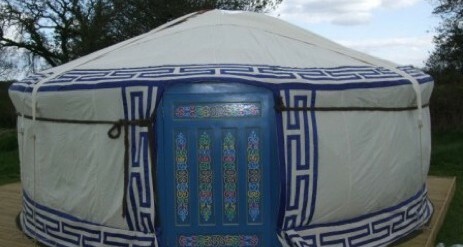 We stayed in the Mongolian Yurt, it was sooo cool and relaxing loved the wood burning stove and the farm it was on was brill with trampoline included! I was looking for a special place for my husband’s 50th birthday. He loves camping, but I wanted something a little easier. It had to be dog friendly, not too expensive, not crowded or commercial, in the countryside, quiet….with the ability to chill champagne and do a bit of cooking! Finally found Holly Farm and what a find it was. 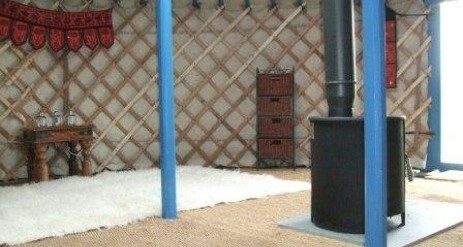 We stayed in the super comfy, private, unbelievably spacious yurt. Loved it! The open sided barn had everything we needed for storing and cooking food. The shower room was new, super clean, spacious….totally unlike any shower room you’ll find on a campsite! The compost loo was easy to use and odourless. Jason and Tracy were helpful and friendly and recommended the Tytherleigh Arms for dinner: a short ten minute drive away. (Great food…save room for dessert!). Ozzie is gentle and got along great with our active terrier. Perfect place for a long weekend. Would be fun to come back with friends or family; the small size of Holly Farm means you can easily have the place to yourselves. Last but not least: the stars!! Almost no light pollution. We welcome well behaved dogs. Ozzie always enjoys meeting new visitors!